Chanting "Harry, Harry!" and "Meghan, Meghan!" 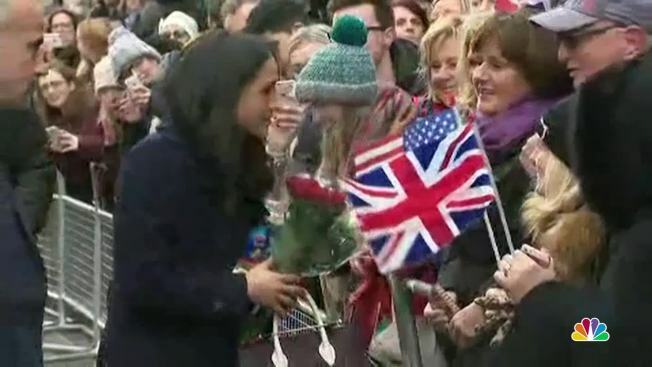 hundreds of people lined the streets of a central English city Friday to welcome Britain's Prince Harry and his American fiancee, actress Meghan Markle. The couple's visit to Nottingham was their first official commitment since they announced their engagement on Monday. 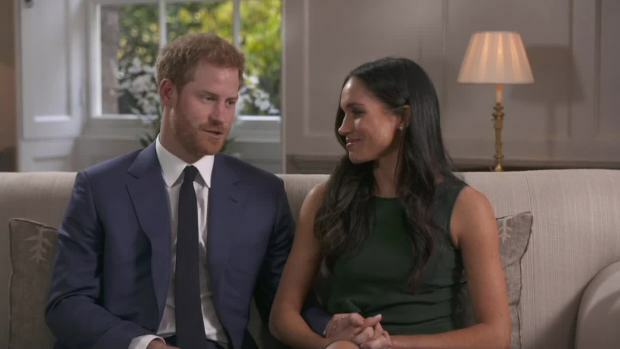 They plan to tour Britain over the next six months to give Markle an opportunity to learn about the country before their May wedding in the chapel at Windsor Castle. 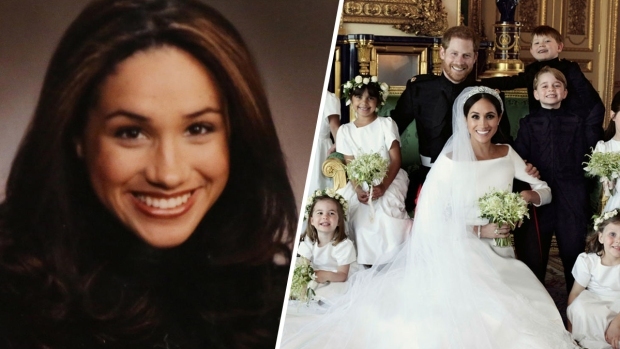 Markle smiled and looked confident as she basked in the adoration of a crowd that had waited for hours in the cold to catch a passing glimpse of the couple. Dozens waved British and American flags. A few were lucky enough to see the engagement ring up close as Markle shook hands. But the ring was old news for British commentators, who instead focused on her handbag — a Strathberry tri-color leather tote designed in Scotland and handcrafted in Spain. The couple traveled to the east Midlands in England to visit to a youth project and to raise AIDS awareness. Their fans followed, including Irene Hardman, 81, who brought a gift bag with fridge magnets and candy for Markle. Hardman wept with joy after handing the bag to the bride-to-be. "I cried — she's wonderful, and it's fantastic," Hardman said. "They're so genuine." The trip was Prince Harry's third to Nottingham since October 2016. The prince has long championed AIDS charities, following in the footsteps of his late mother, Princess Diana. Prince Harry's spokesman Jason Knauf said the prince had been looking forward to introducing Markle "to a community that has become very special to him." Holly Burdett, who is originally from West Bridgford, Nottinghamshire, but now lives in Sydney, Australia, returned home on the "gamble" that the couple would announce their engagement while she was there. "I always thought I'd marry Harry, but you can't win them all," Burdett joked. "As long as they're happy, that's all that matters."